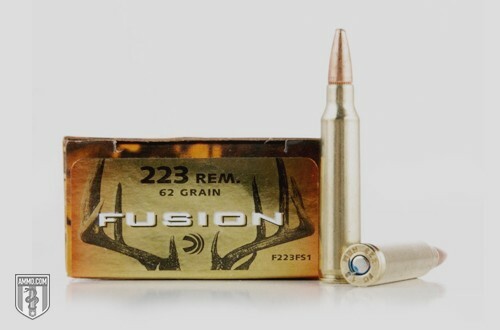 Fusion is a line of ammunition from Federal Premium well known for deer hunting. The name comes from the fact that the jacket is electro-chemically fused with the lead core, so there is almost no chance of early separation. When these impact a target, the skived tip allows very good and consistent expansion, even at very long ranges. This line of ammo also has quite a variety of different sizes for hunting, from handgun to African game and everything in between. This ammo type is marketed as “mid-range” by Federal Premium, and is somewhere between average and “premium” ammo. Most commonly found in .223 to 7mm Rem. Mag., Fusion can accommodate most any hunter's needs. Skived Tip: An exposed core means that upon impact, it’s guaranteed to expand rapidly for maximum stopping power. It expands uniformly with each shot (similar to a hollow point). Pressure-Formed Core: The core of the bullet is very important due to weight and balance issues. These cores are identically created with high pressure and with almost no weight deviations. This adds to strength and also how expansion occurs. Molecularly Fused Jacket: The bullet jacket is so well fused to the core, that separation isn’t going to happen often, if at all. Wtih this type of fusion, the bullet core material is also more evenly distributed within the jacket. This aids accuracy, penetration and expansion. Boat Tail: At mid to long ranges, boat tail bullets are well known for their accuracy and reliable grouping. This gives the shooter the ability to make long range shots consistently. If you’ve used regular lead bullets with different jackets, sometimes they don’t perform as expected. The Fusion line is very uniform with each shot, as the bullets group very well and expand similarly when they strike a target. Naturally, where you hit a target will change that quite a bit. For instance, hunters know that if you strike soft flesh versus shoulder bones, the wound creation will be very different. This round is marketed mainly for hunting, so it’s an advantage that you can use it most everywhere hunting is allowed. As a factory ammunition, it may not perform as well as top-of-the-line reloaded ammo or other premium deer hunting ammo lines. For the average shooter, this won’t be a concern. But for professionals, every advantage possible will usually be preferred. Overall, this is a well-respected line of game hunting ammunition, and hunters across the world seem to think highly of it. The inclusion of handgun rounds is also a nice touch, even though you won’t run across too many people who hunt whitetails with a pistol. There’s also muzzleloading ammo and primers.